TEEN lovers Justin Bieber and Selena Gomez are on the rocks - because of his bad boy hip-hop friends. The pair are taking time out after Selena, 19, ordered the clean-cut pop idol to ditch his new pals, The Sun can reveal. It came after Justin, 17, arrived at one of Selena's gigs in Florida last week with rap ace Sean Kingston, 21 - a former child burglar. Justin is also close to gun-charge former convict Lil Wayne and has released a track with R&B's Chris Brown, who beat ex-lover Rihanna. A pal of Disney star Selena revealed: "Selena told him to stop hanging with these bad people. "She didn't want him to crash her gig. They had a huge row and said it was good they were having time apart while she was on tour." But the next day Justin and Sean caused hysteria by cruising through Miami in an open-top Rolls-Royce. A pal of Selena said she saw Justin in tears during rows with her. She said: "It's hard seeing a little 17-year-old crying and saying he loves her." Justin Bieber rocks his underwear while taking a dip in the pool on Saturday (July 30) in Miami, Fla.
Look at how much he’s changed in just one year! The 17-year-old pop star soaked in the sun with singer pal Sean Kingston, who was seen relaxing on a lounge chair. Aww, our boy Justin Bieber is growing up! The Biebs showed off his scandalous side this week - he was photographed poolside in Miami wearing nothing but his skivvies, and later in the week he was caught on camera wearing a Cee Lo Green-inspired t-shirt with the words "F**K YOU!" displayed on it. For a while, it looked as if Justin Bieber was going to win the chance to be inducted into the 2011 Celebrity Bowling Hall of Fame, but now, all of a sudden, he's got some pretty stiff competition—and is no longer in the lead. Miley Cyrus, who was behind by 17 percent just last week, has made a huge turnaround and is now ahead of Justin and everyone else. After Miley's fans learned how far behind she was, they stepped up to the plate and cast their votes—and enough of them did so to place Miley in the leading spot by 9 percent, leaving Justin behind in the dust. 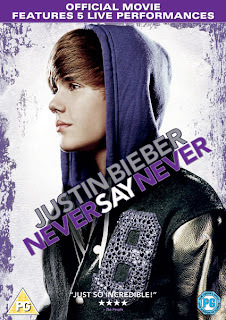 Will Justin Bieber be runner-up again this year? Last year Bieber was runner-up to Taylor Swift. There are ten 2011 nominees in total. The other eight are Lady Gaga, Nick and Joe Jonas, Lil Wayne, Michael Jordan, Jeff Bridges, Bill Murray, Jimmy Fallon, and Kim Kardashian. "Each of the celebrity candidates are bowling fans, enthusiasts or have helped to publicly support the sport of bowling." Bieber fans, relax—there is still a chance he could make a comeback, but it's all up to you! Fans need to cast their votes for the celeb they want to win. Steve Johnson said, "Although the race appears to have come down to Miley Cyrus and Justin Bieber for the 2011 nomination, the voting remains close enough that any of the other celebrity nominees could make a comeback by fans casting votes at GoBowling.com. Last year we saw a flurry of votes take place in the final few days with fans rallying behind eventual inductee Taylor Swift to overtake Bieber. We anticipate a down-to-the-wire race once again." Who knew bowling could be so exciting? Whether you want Miley Cyrus or Justin Bieber, or one of the other eight nominees to win, you've only got until 11:59 PM CT on Saturday August 6th to vote. As a thanks for voting, you will "receive a coupon for a free game of bowling that can be used at one of more than 4,000 participating bowling centers across the United States." Who are you going to vote for? Will Miley Cyrus win? The mere mention of his name is renowned for sending young girls giddy with delight. So the news teen sensation Justin Bieber is auctioning a pair of his worn Supra trainers for charity should have been enough to kick off a bidding frenzy. 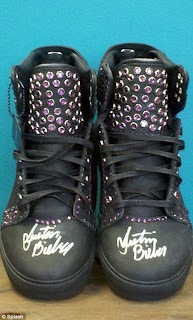 Bieber Fever has failed to take hold however, as just four bids have been made despite the lot being open since July 19. Charity auction website charitybuzz.com will be hoping there will be a last minute stampede to land the unique item, as the proceeds are being used to benefit the Ovarian Cancer Research Fund. Bidding for the shoes closes next Wednesday, so there is still plenty of time for fans to get in line. One crumb of comfort for auction organisers is the fact $900 has already been bid for the sweaty sneakers, which is nothing to be sniffed at. However the revelation will add more credence to claims the singer's popularity is finally declining after his near omnipresence over the last few years. Bieber, who is dating teen favourite Selena Gomez, burst onto the music scene two years ago as a cutesy, clean-cut pop sensation. But it would seem Justin Bieber is becoming quite the rebel these days. Earlier this week the 17-year-old star was spotted wearing a T-shirt which literally turned the air blue with an unmissable, unsavoury song lyric printed in huge white writing. With some swagger in his step, the cocksure singer strode out of the Armani Exchange shop in Sunset Plaza, Los Angeles, where he had just purchased some new clothes, perhaps including new shoes. However the lazy vocalist let his lacky carry his shopping, keeping his hands firmly in his pockets. No doubt the parents of his many legions of young fans would not be too impressed with Bieber's choice of attire. With the singer set to celebrate his 18th birthday next year, it seems Bieber taking strides away from his childlike image. He has an older girlfriend in the form of 19-year-old Selena Gomez and has also been topping up his tattoos recently - bringing his total to three. The star has just returned from Miami, where he joined his Gomez on her Dream Out Loud tour. Bieber was also spending time with singer Sean Kingston, who recently recovered from a jetski accident. He is taking a month off to relax with his pals - and of course Selena - before beginning work on his next album. Justin Bieber has confirmed that he, and that voice of his that all the girls love, will be making an appearance on Asher Roth's sophomore album. Girls, get ready to hear Justin do a little Hip Hop! On August 2, Justin tweeted: "did a lil something on the upcoming @chrisbrown mixtape.. Ladies love me. then we got crazy on the @asherroth album. 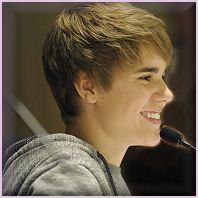 #shawtymane"
Yes, Justin....the ladies (the young ones, anyway) absolutely do love you. They think you are flat-out adorable, especially when you step out of your own singing territory. This is not Bieber's first venture into unchartered territory. The young singer has rapped over the "Speaking In Tungs" track of Vado and Cam'ron as alias "Shawty Mane." Justin is also working with Chris Brown these days. 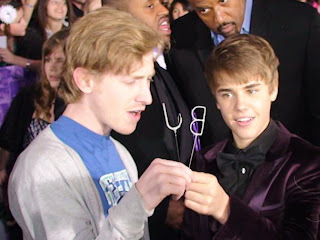 According to Hip Hop DX, Asher Roth has known Justin Bieber for a long time. They both have Scooter Braun as manager. Bieber's hashtag in his tweet indicates that it will be his alias 'Shawty Mane' that makes the appearance on the Roth album. It's always great when artists collaborate with one another, and it will be interesting to hear the results of Justin Bieber's venture with his friend Asher Roth. It looks like Target is the lucky retailer to exclusively sell Justin Bieber: Never Say Never Director's Fan Cut, a Paramount Home Entertainment production. The two-disk DVD will be on sale in Target stores nationwide beginning August 23, just a few weeks from now. As if that wasn't exciting enough news for the girls, check this out: the DVD set comes with an exclusive Bieber necklace—OMG, don't you just have to have that? The two-disk set also includes a digital copy, and comes in a "collectible keepsake box." All this, plus more than an hour of new features, for only $29.95. According to Home Media Magazine, "The director's cut includes 34 minutes of footage not included in the original film (which Paramount released on disc in May) and bonus features include a behind-the-scenes look at the Justin Bieber My World Tour, featurettes "Day of the Concert," "More Less Lonely Girls," "Sound Check Parties," "The Dougie" and "The Rocket Ship Girls," along with interviews and a performance of "Baby" for a select group of prize-winning fans." Hint to parents: It's never too early to start your holiday shopping. Better get to your local Target store ASAP once this DVD set hits the shelves, because with all the Justin Bieber mania out there, it's bound to sell out quickly.